PATIENT HISTORY: No clinical data were recorded. The infant's spinal column together with an ellipse of the overlying tissues and skin of the back has been removed. Externally, there is a bluish cystic swelling at the lower end of the infant's back. 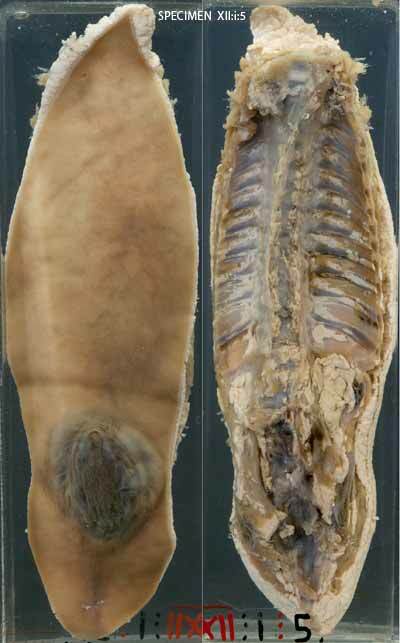 The other side of the specimen shows the disruption of the spinal column in the corresponding lower lumbar region. The cystic swelling is covered in part by skin and in part by meninges only. Further dissection would be necessary to establish whether this is a meningocoele or myelomeningocoele. Neural tube defects involving the spine range in severity. They usually affect the lumbarsacral part of the spinal column and cord. The mildest anomaly is a symptomless bony defect in the spinal column (spina bifida occulta / spinal dysraphism). In severe cases there is a segment of spinal cord that is splayed and disorganised, and which protrudes from the gap in the spinal column under a layer of meninges (myelomeningocoele). Intermediate to these forms is the meningocoele, where there is only a meningeal extrusion. Neurologic dysfunction related to myelomeningocoele depends on the level of the lesion. If it is below the sacrum the child will be able to walk, but if it is above the 2nd lumbar vertebrae it is likely the child will be wheelchair dependent. Bowel and bladder function are also affected. Infection of the lesion and consequent bacterial menengitis will worsen the situation so that closure of the skin defect should be done soon after birth. Many cases of neural tube defect are complicated by hydrocephalus due to deformity of the brain stem and fourth ventricle (Arnold-Chiari malformation). Myelomeningocoeles are caused by failure of closure of the neural tube. Genetic and environmental factors play a role. There is an approximately 5% recurrence risk for a mother who has had one affected baby. Maternal folate deficiency has been implicated by epidemiological studies. A lack of folate is thought to adversely affect cell division during the critical period of neural tube closure in the first trimester. In some countries, legislation requires certain foods to be fortified with folate, and this has been shown to reduce the incidence of neural tube defects in the population. Pregnant women should also receive a folate supplement. Ante-natal detection of neural tube defects is based on alpha-foeto protein levels in maternal blood, and on ultra-sound imaging. Where a significant neural tube defect is detected, termination of pregnancy is an option. Intra-uterine repair may be attempted where such advanced health care options exist. After birth, aggressive surgical treatment is required to achieve the best possible outcome for the child.